When welders fuse together metals, they don't always use metals with similar compositions. Often, dissimilar welding is required to create the most formidable structure. 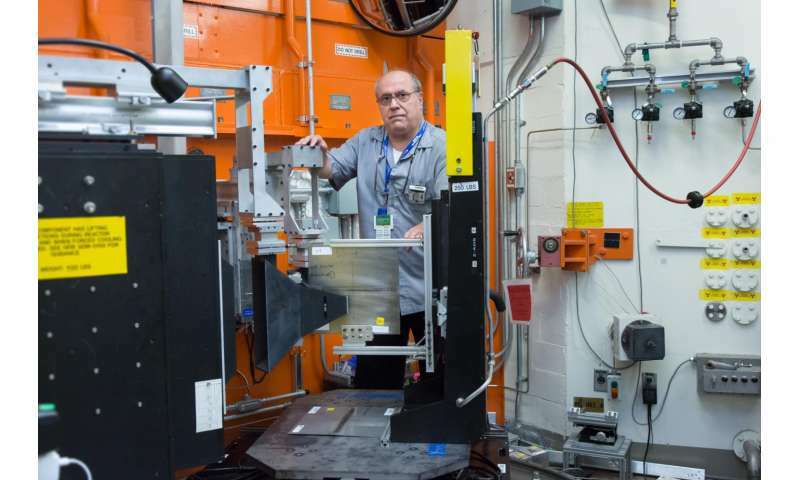 Daryush Aidun, a Mechanical and Aeronautical Engineering Professor at Clarkson University, has come to Oak Ridge National Laboratory's (ORNL's) High Flux Isotope Reactor (HFIR) to study residual stresses in dissimilar metal welds. Using the Neutron Residual Stress Mapping Facility (NRSF2), HFIR beam line HB-2B, Aidun's goal is to better understand how and where stresses are distributed in dissimilar welds to improve their structural integrity. "Dissimilar welds occur when you weld materials from two different alloy systems," said Aidun. "Because these materials have different characteristics, this type of welding can produce significant left-over stress, known as residual stress. "Dissimilar metals welding is now becoming very important for petro-chemical and power industries due to economic incentives. We need to know where stresses—in particular tensile stresses—are distributed in these weldments and how we can minimize them." In his experiment at NRSF2, Aidun is studying stress levels in stainless and low carbon steels before and after they are welded together. "When we say steel and stainless steel, we are really talking about two different metals," said Aidun. "They have different thermo-physical properties, which plays a crucial role in their weldability to each other. Particularly effected are their thermal conductivity and coefficient of thermal expansion with respect to residual stresses." Because neutrons are highly penetrating, they are especially useful for this research. "X-rays are good for seeing a millimeter or two inside a material, but neutrons can penetrate several millimeters deeper," said Paris Cornwell, a scientific associate at HFIR who helped Aidun with his experiment. "This allows us to collect more data and see what's happening deep within a weld." The real-world impact of this type of research is far-reaching, says Aidun. "If you're welding pipes for example—say even something like the Trans-Canada Oil Pipeline—you may end up welding dissimilar metals at some point. You need to know where these residual stresses are concentrated. Otherwise, you risk creating a weak weld and facing a possible structural failure."